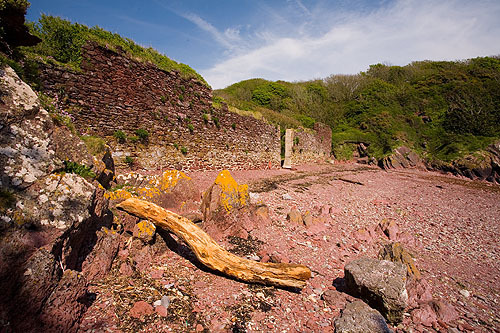 Monk Haven Bay with an 18th Century Wall , part of the Trewaren Estate Boundary. The Townsend "Tuff" band appears on both sides of Monk Haven in the Old Red Sandstone cliffs . The band comprises 3 separate Volcanic ash falls .The "Tuff" was formed as a result of Volcanic Dust and Ash being deposited in the sea and forming a sedimentary layer on the sea floor (RIGS 536).